Above: Marcin Hrehoruk, General Manager; Shelley Peterson, Controller; Kris Pawlikowski, Sr. Project Manager; Kim Zurowski, Estimating and Business Development Manager and George Devlin, President. Photo by Rebecca Lippiatt Photography. More than 300 employees. An impressive fleet of branded equipment that is well-known across Edmonton and all of its suburbs. 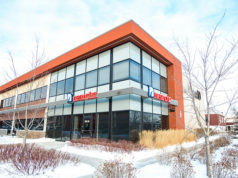 A large multi-story office in one of the city’s best known industrial districts. Must be a company steeped in history and tradition with roots going back for decades, right? No. It’s Devlin Construction Ltd., a runaway success story just 15 years in the making. Today, the company is known for building concrete and asphalt roads, heavy excavating, base construction, building sidewalks, snow removal and much more. This year marks 15 years as a company, and seven years with the current management team that rocketed the company forward. In early March, George sat with that management team, reflecting on the journey – and the overarching sentiment was, “whoa, what just happened? !” as they discussed how fast Devlin went from a small business to an in-demand corporation. Marcin Hrehoruk, general manager, came on board when the company had grown to around 28 employees. That same summer, under the new name of Devlin Construction the company grew to 55 employees, evolved to include asphalt and concrete work, and purchased its first property in Winterburn. George and Marcin met while sharing a cab 21 years ago. As fate would have it, they wound up working at a local asphalt company together. A few years into that job, they parted to make their own ways in the world. The world had other plans, and after another meeting again in Montana in 2010, they shook hands over lunch and became business partners. Shelley Peterson, controller and office manager, started with Devlin Excavation from its inception. 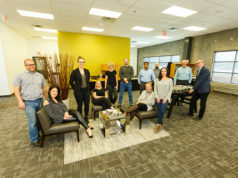 In 2015, Devlin Construction moved to a much larger space in Winterburn, and now the staff comfortably enjoys a large, modern, roomy base of operations. 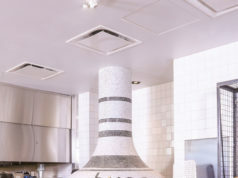 Devlin Construction prides itself on growing to become a full service company that keeps pace with construction companies that have much more time and experience in the business. The management team cites the willingness of Marcin and George to take risks, the team’s cohesive way of working together, the excellent care they take of their staff and clients and their outstanding reputation as reasons for the company’s rapid growth and success. “We treat everyone equally,” adds Kris. Devlin Construction gives equal respect to the staff, which has helped the company maintain very low turnover – a rarity in the construction business. Safety is also at the forefront of each project and decision. “In 2008, George came to me and said, ‘we can’t bid on these jobs because we need COR.’” COR stands for certificate of recognition, and it is issued to companies who have a health and safety plan in place that meets strict third-party guidelines. 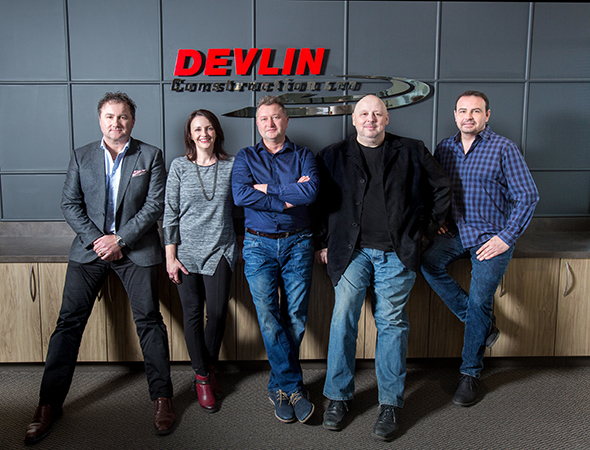 Using this technology has enabled the entire Devlin team, field and office, to go 90 per cent paperless, and to maintain a very high rate of accuracy, communication and efficiency with every project. In addition to outstanding relationships with staff and clients, Devlin also focuses very heavily on giving back to the community. Devlin opens the doors to others to help them raise these vital funds by providing information about the tournament and sponsorship opportunities at golfdevlin.com. The company also proudly supports local sports teams, church groups, the Sturgeon Community Hospital Foundation’s annual gala and more. While Devlin Construction has been fortunate to receive awards and recognition from many high-profile clients over the years that thank them for providing an outstanding end product and a clean, organized jobsite, one incident is very fondly remembered by the management team: receiving home baked cookies from a group of students as a thank-you for getting their school fixed and opened on time. The management team all agree that it doesn’t feel like 15 years has passed. In fact, as they sit in the boardroom thinking about the start of the company (just something fun to do, as George had put it) to the reality of today, a moment of silence turns into bright smiles as they commiserate about the company’s growing pains and celebrate the many milestones. More than once, George and Marcin have been asked how many cities they operate out of, or if the company is multinational. They certainly are, and with 15 (very fast) years gone by, Devlin Construction plans to continue building their legacy. They may be the new kids on the block, but they also planned, designed, poured, landscaped and finished that block, and then returned each winter to clear the snow off of it. So watch out world! With Edmonton and area having no shortage of Devlin projects on the go, the future is unlimited.